On the last days of October my friends and I have decided to visit the Khor River near Khabarovsk. This big mountainous stream is flowing south-east and south from the city, and joins the big Ussiry River near the Chinese border. The distance to the middle part of the river is only about 200 km, but we had spent almost 5 hours for this route. Many old bridges at this road are broken, so we were driving slowly. We were planning to fish this little river, but there were already no grayling in its nice-looking pools. After several frosty nights all grayling had migrated downstream into the Khor River, to the wintering places. The morning was really cold, especially after a long hot summer. My friends have started to catch grayling by the local method. It is chumming with natural insects; most of the local fishermen use this method for catching grayling and sometimes lenok. The fisherman enters the river somewhere near the riffle, wades out to the depth between 2 and 3 feet in rather strong current, and starts kicking the rocks and pebbles. The insects and other fish food is washed by the river downstream, and the fish start getting lots of food. The active grayling and lenok swiftly move upstream to the source of the morsels, and stop close to the fisherman’s feet. The tackle is simple — a 12-14’ long lightweight telescopic rod with a reel, a bobber, a small sinker, and two weighted flies at the short tippets. This kind of drift fishing is very popular in Khabarovsk. The most difficult task is the selection of the flies. Skillful fishermen carry hundreds of flies of different sizes and colors. Most often grayling is caught with #12 and 14, and lenok — with #10 or 8. The flies imitate scuds and stone-fly nymphs; in the fall the bright fluorescent colors are often the best. I was using a fly rod and tried to catch «wild» fish with a classic nymph technique and no chumming. I was able to catch some grayling but my friends were doing much better. Earlier in the season, when it is warmer and grayling is often feeding from the surface, a fisherman with a flyrod can have more action than the one using a drift rod and presenting his flies near the bottom. On the last days of the open-water season when there are no flying insects, the bottom presentation works much better. The best flies of the day. 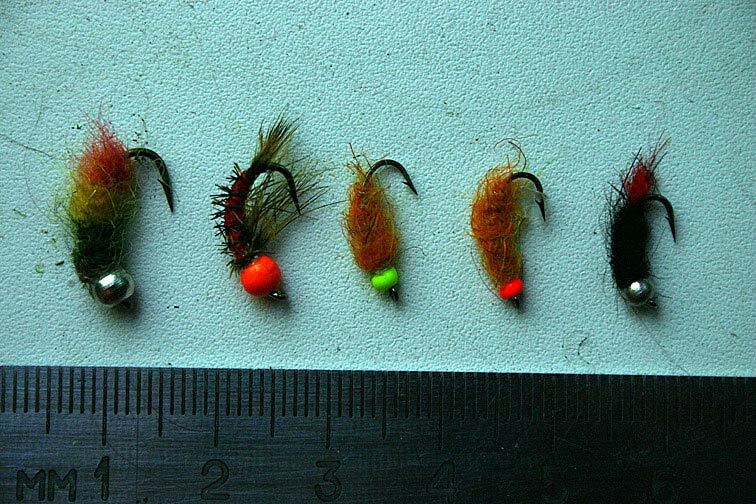 This selection is not sufficient for different seasons and other rivers — the skillful fishermen carry hundreds of flies of different sizes and colors. In the end I want to propose you a riddle: what is the name of a bird which had built this nest in the forest of the Far East?